The National Post reports, 23rd March 2017: There’s a huge biological change happening on the banks that extend off Newfoundland and Labrador’s north-eastern coast. The northern cod are coming back. And they’re eating the shrimp that had taken over their home range off the northern Grand Banks of the Labrador Coast. The return of the once mighty northern cod stock may be a boon for the natural world and, eventually, for the humans who haul them from the sea, process them and eat them. After all, their disappearance 25 years ago almost killed the east coast fishing industry and seriously maimed the Atlantic provinces. Now their return brings economic and social upheaval. A few million tonnes of cod, famished from their spring spawning on the offshore banks, were chasing billions of capelin into shore. “When they get in amongst the capelin, they just gorge themselves,” said George Rose, a former Fisheries and Oceans Canada scientist who literally wrote the book on how man destroyed one of the earth’s greatest wild protein sources. “Cod: The Ecological History of the North Atlantic Fisheries” reads like a Shakespearian tragedy, with man’s pride in his own power and knowledge leading him to destroy one of nature’s greatest gifts. 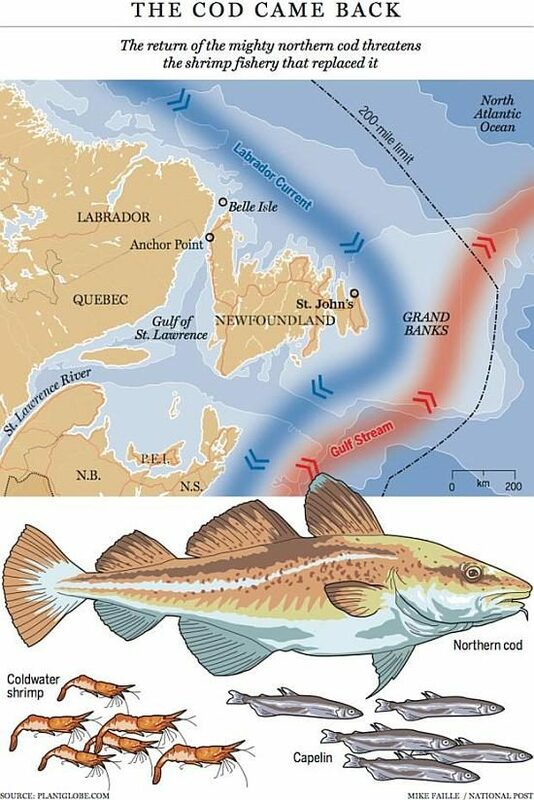 The southern Grand Banks, the Gulf of Maine, Scotian Shelf and Gulf of St. Lawrence are all home to their own cod stocks that have not shown significant signs of recovery since the overfishing of the late 20th century for reasons that are not fully understood. But the biggest of all the stocks by a wide margin was the northern cod. For the last decade the northern cod stock has been increasing at a rate of about 30 per cent per year. Fisheries and Oceans Canada’s 2016 stock assessment estimated its total biomassThe amount of living matter. This is therefore a different measure to numbers of organisms. So, for example, there is much more biomass in 1 elephant than there is in 1000 fleas and there may be more biomass in 100 large cod than you would find in 150 small (because of over fishing) cod. at around 300,000 tonnes. That’s well short of the million tonnes Fisheries and Oceans has pegged as the size of a healthy resource. 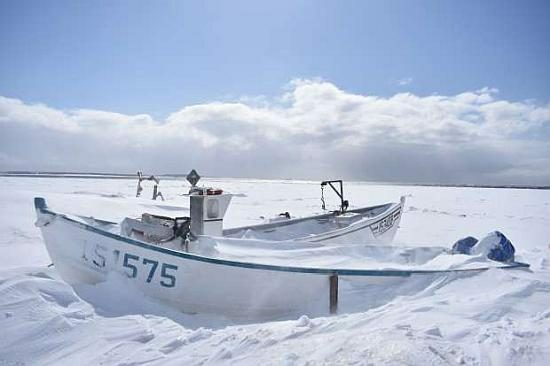 But it’s ten times as many fish as were there were on 2nd July, 1992, when former fisheries minister John Crosbie announced the cod moratorium that resulted in the biggest lay-off in Canadian history — an estimated 45,000 jobs. Nobody knows how big the northern cod stock once was. But fishing records tell us that back in 1968, when Rufus Genge made his first trip to Belle Isle, 800,000 tonnes of northern cod were caught. Another 400,000 tonnes were taken from the stocks on the southern Grand Banks. Eighty per cent of that catch was by foreign draggers from Spain, Portugal, the Soviet Union, Japan and France. The cod stocks are the gift of plate tectonics. When North America tore itself from Europe and Africa 200 million years ago, and started floating east, it took some of the Old World with it like a memento for its long voyage.That keepsake is a shallow underwater plateau that stretches for up to 500 kilometres off of Newfoundland and Labrador’s east coast. “It’s monstrous and there’s no other place like it on the planet,” said Rose of the Grand Banks. Frigid arctic water is pumped south by the Labrador Current toward the Gulf Stream, which pulls up warm waters from the south. The churning of these two currents sends nutrients from the Atlantic’s dark floor up the precipitous underwater shoulders of the Grand Banks into the light column. In a kind of underwater alchemy at 150 metres below sea level, trillions of microscopic plants called plankton Plankton is a generic term for a wide variety of the smallest yet most important organisms form that drift in our oceans. They can exist in larger forms of more than 20cm as the larval forms of jellyfish, squid, starfish, sea urchins, etc. and can be algae, bacterial or even viral down to as small as 0.2µm. They are nutrient and light dependent, and form the essential foodchain baseline for larger dependent aquatic lifeforms. Fish species rely on the density and distribution of zooplankton Zooplankton form the group of tiny animals such as minuscule jellyfish and rotifers present in the marine environment. They are a major source of food for those higher up the food chain, and their numbers relate directly as a good indicator to the nutrient enrichment of the sea of the area. Note: phytoplankton are microscopic plants, and zooplankton are microscopic animals. to coincide with first-feeding larvae for good survival of their larvae, which can otherwise starve. Man-made impacts such as dredging, dams on rivers, waste dumping, etc can severely affect zooplankton Zooplankton form the group of tiny animals such as minuscule jellyfish and rotifers present in the marine environment. They are a major source of food for those higher up the food chain, and their numbers relate directly as a good indicator to the nutrient enrichment of the sea of the area. Note: phytoplankton are microscopic plants, and zooplankton are microscopic animals. density and distribution, which can in turn strongly affect larval survival and thus breeding success and stock strength of fish species and the entire ecosystem. They also form the essential basis of CO2 take up in our seas ecosystem, hence Global Warming. harness the sun’s energy to convert the nutrients into biological matter. Tiny little animals called zooplankton Zooplankton form the group of tiny animals such as minuscule jellyfish and rotifers present in the marine environment. They are a major source of food for those higher up the food chain, and their numbers relate directly as a good indicator to the nutrient enrichment of the sea of the area. Note: phytoplankton are microscopic plants, and zooplankton are microscopic animals. feed upon the plants and bring life closer to a size that we can actually see. There are two predominant directions that zooplankton Zooplankton form the group of tiny animals such as minuscule jellyfish and rotifers present in the marine environment. They are a major source of food for those higher up the food chain, and their numbers relate directly as a good indicator to the nutrient enrichment of the sea of the area. Note: phytoplankton are microscopic plants, and zooplankton are microscopic animals. can take to make their way up the food chain on the Grand Banks: through crustaceans like northern shrimp or through the small baitfish capelin. “You can’t have both,” said Boris Worm, a marine biologist at Halifax’s Dalhousie University, who has studied the inverse relationship of cod and shrimp. That is to say you can’t have both a capelin-cod dominated food webThe totality of interacting food chains in an ecological community and a crustacean-dominated food webThe totality of interacting food chains in an ecological community on the shelf that extends off Newfoundland and Labrador. Cod do eat shrimp. But after going a month without food during the spring spawning season what they really need is the capelin that refills their livers with the fatty lipids to survive the winter to come. We appear to be headed back to the traditional order of a capelin-cod dominated food chain. Indeed, the MP’s fisheries committee is also urging closer monitoring of capelin stocks, as well as limits on seal populations, which prey on both cod and capelin. As the water cooled during the late 1980s, capelin stocks plummeted for reasons that still aren’t understood. They were not heavily fished. Cod, losing its traditional food source, began gathering in tighter schools of fish and migrating farther south toward the warmer nose and tail of the Grand Banks where they could find more food. Meanwhile, sounders allowed trawlers to peer into the depths and scoop up the tightly packed fish in bag-shaped nets dragged hundreds of metres below the water’s surface. Marinet observes: Is this encouraging news? One would dare to hope so, but the reality is that the original stocks disappeared due to over-fishing aided by the failure of governments, both Canadian and of other nations, to take any action to prevent it. Have we now arrived at a point where over-fishing would not be repeated? There is little evidence to assert with any conviction that this might be so. In the EU over-fishing was meant to cease from 2015 onwards. However it still persists under government direction in the case of around 60% of NE Atlantic stocks and of 90% of Mediterranean stocks. That is not exactly convincing evidence that either fishermen or governments have changed. What is also true is that it is only the northern Newfoundland stock that has shown some sign of recovery, with southern stocks still endangered and at very low levels. It is far too early to say the Newfoundland stocks have recovered. All remains in the balance.